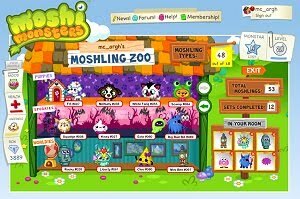 Moshi Monsters is an amazingly cute free online game for kids, where everyone can adopt a friendly pet monster and play several games online.Each pet has their own personality that will improve depending on how you treat and play games with them. The money you earn from games will help you to get new and exciting items to change the way your pet looks.Always keep an eye on your pet, since he needs to be fed and kept happy. And don’t forget to customize your own Moshi Monster house.